DOES NOT include hot dogs or buns. This machine is perfect for picnics, carnivals and more. This exciting Hot Dog Steamer with Bun Warmer is just what you've been looking for. This unit cooks delicious Hot Dogs and warms buns at the exact same time. 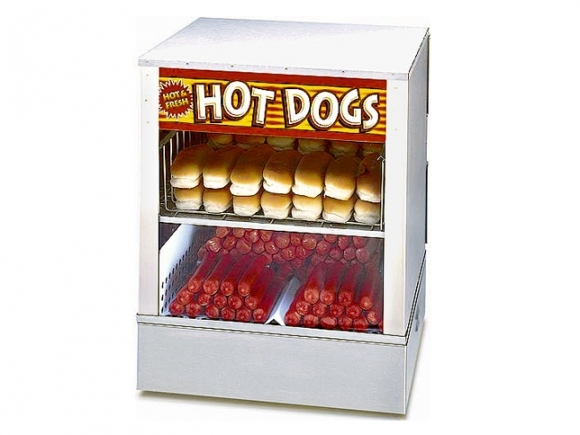 With 50-piece Hot Dog capacity and 30-piece Bun warming capacity, you will never run out. Both the cabinet and lids are made of stainless steel and best of all, it runs off 120V electrics for maximum portability. It cooks hotdogs in 40min and then keeps the hotdogs and buns warm for the entire party!